Years ago, she made a pact with 'Laser' to never betray and to be a friend even when the world would turn on him. Though this has seemingly come true, May had never argued or questioned Laser's descisions in any and all acts he has done. Though, to some, she argued his marriage to Amanda Grant, but unlike the hunter Katrina, May has coped and used this to her advantage. She was, thankful to say the least when the marriage of Laser and Amanda ended, it would seem this "Kagagiou" person wasn't all talk after all. A high level telepathic psionism expert, May knows when and how far she could push Laser without getting him to become enveloped into his "Kagagiou" persona. "This girl, once registered as a fighter, now watches over Laser like a guardian. 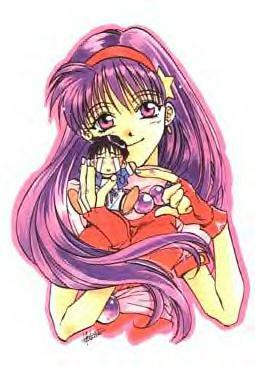 It's odd, but she gives off the same aura as Athena, but, I can tell she's not that girl..."